Rovio Patrols Your House, Gives You Live Feeds Via WiFi | OhGizmo! When I leave my house for any period of time I don’t generally worry about my place getting broken into, as I live in a pretty decent neighborhood. Since I have pets there’s usually someone stopping by to check them regularly, so I don’t usually give things a second thought. However, if I were the paranoid sort, I’d buy myself a Rovio in a heartbeat. 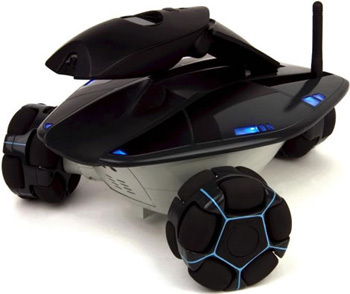 The Rovio is a WiFi-enabled spybot that can navigate your entire home with ease. There’s really not much more you can ask of a spybot. This little guy can patrol your house 24×7, and you can access its audio and video footage from anywhere in the world. Look for this guy to hit stores this fall for around $299. The rovio looks alot like the rover robot that has been available on ebay for several months. It is the same concept, and is much more autonomous then this robot. It has been protected under copyright since 2006. A youtube reply to the rovio will be up tonight.